For your flush floor aeration systems, Boone Aeration & Environmental offers two separate hardware packages for installation. In cast concrete floor channel, system packages are available for all bin diameters. Based on your type and volume of grain and desired moisture levels, Boone Aeration & Environmental aeration experts can recommend a standard system or fit a custom installation to fit your needs. Each system is sized specifically for your needed air volume and depth of grain. Installed with sheet supports to make up your complete duct system. They're designed to withstand the weight of grain and pedestrian traffic in the bin. These sheets are 14 gauge galvanized steel and perforated for passage of air through your grain. 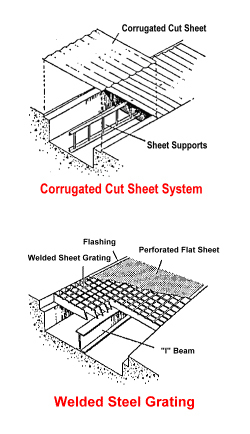 When your operation uses end loaders or heavy equipment to handle the grain inside your bin, install rugged steel grating in place of corrugated sheets. When covered with perforated flat steel sheets, these give a permanent heavy-duty floor duct system. Rolfes @ Boone, located on the east edge of Boone, Iowa, began business operations on April 1, 1994. Boone Cable Works & Electronics is employee owned and is a full-line manufacturer of grain termperature detection and hazard detection equipment. All design, engineering, manufacturing, and sales functions are performed "in-house" in our 22,500 square foot facility.